Faux chicken salad is a favorite around here, especially for lunches and picnics in the summer. But sometimes, we want to mix it up. This recipe is delicious and easy – and exotic. We took familiar flavors and twisted them into eclectic combinations to end up with a new Beyond Chicken salad sandwich that tastes new and different. Start with the pesto: watercress is in season and is best eaten raw to retain the active phytochemicals known as isothiocyanates, the same disease fighting components found in broccoli and cabbage. Mix up the watercress with a spicy jalapeno, add the feremented, umami goodness of miso, and sunflower seeds for protein and iron. The flavor is lively and robust. But we don’t stop there ~ you’ve got to try the marinade, too. Yes, this recipe is unusual. But we promise, it’s worth the gamble. Give it a try as a sandwich or try the option to make it as a hot dinner, below. Your Beyond Chicken experience will never be the same! Your favorite sandwich fixins’, such as lettuce, sprouts, cucumbers, vegan mayo etc. First, make the marinade by adding garlic, fresh ginger, mirin, rice vinegar, fresh tomato, lemon zest and brown sugar to a food processor or powerful blender. Process until liquid and all pieces of veggies are broken down. Add scallions and pulse a few times so you can still see chunks of green. Add all shredded Beyond Chicken to a large bowl and pour tomato-ginger marinade over top. Fold together, coating shreds completely. Allow to sit in fridge for 20 minutes to overnight to absorb flavors. When ready to serve, make the watercress pesto: add sunflower seeds, jalapeno, watercress, white miso and red pepper flakes to a food processor or powerful blender. Mix until a paste forms, scraping sides down to make sure all ingredients are incorporated. 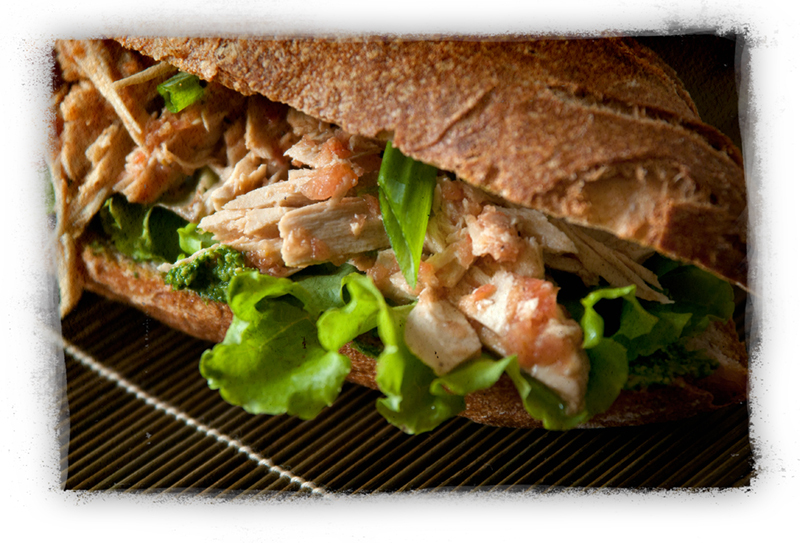 To assemble sandwiches, spread bread with a thin layer of watercress pesto. Stack with lettuce or other sandwich veggies. (We like ours with lots of lettuce and a little vegan mayo.) Top with marinaded Beyond Chicken and serve immediately. Chef’s Note: This recipe would also work as a hot dinner preparation ~ Simply marinade shreds and make pesto, then stir pesto into your favorite cooked pasta or rice, and top with Beyond Chicken and garnish with chopped scallions. New to Beyond Meat’s Chickenless Strips? We invite you to try it with a coupon! Here is a store locator from their site. And so we catch our breath. In the last two months, life here has changed. 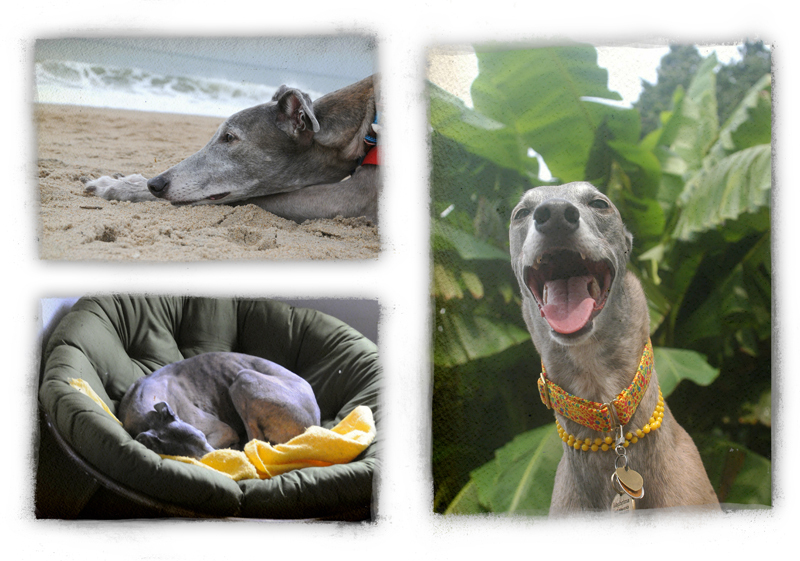 When I started composing this post, the date was April 10th, and it was the day before our beloved greyhound, Lochrima’s, 13th birthday. But before I could finish, she starting limping and on April 13th was diagnosed with cancer. While we knew she was old for a big dog, nothing really prepares you for those words. The vet said it could be days or weeks, that she had a tumor in her chest so advanced, it was pressing on her heart, lungs, intestines and stomach. It felt like Doc kicked me in the gut. The tumor caused her limp because it was restricting blood flow to and from her legs. This was the only symptom of a cancer that was at least months old, if not a year. 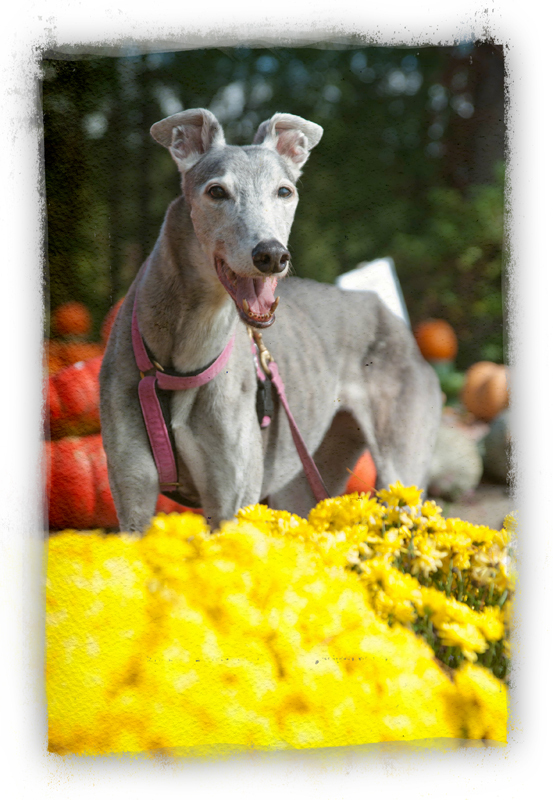 Our sweet greyhound, age 12, on what became her final road trip, October 2014. This was at a farm stand on the way home from Rehoboth Beach DE. Basically, the DH & I dropped everything and spent time with Lochrima. Work and clients waited. Chores were set aside for another day. We found out how amazing our friends were, as many of them showed up with food for us and treats for Lochrima. 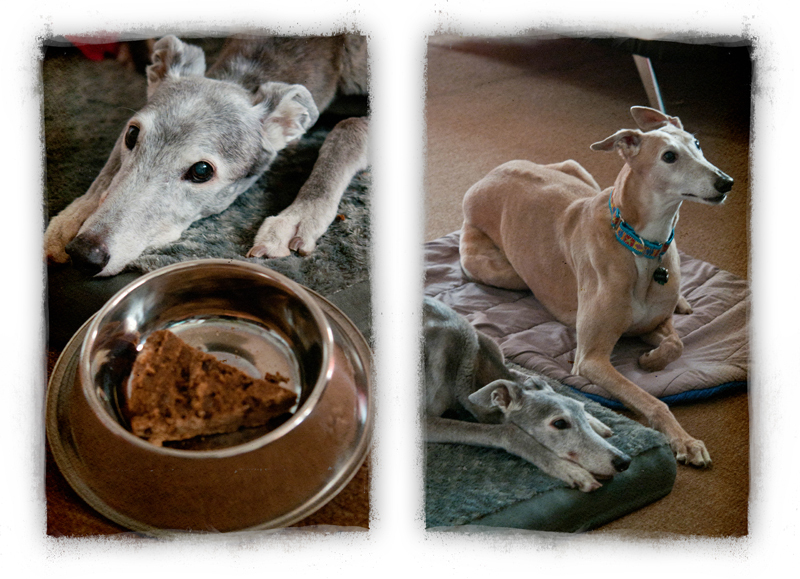 There were visits from dog pals, with whom our girl enjoyed a sniff in the yard and her birthday cake. There were visitors from far and near. Turns out that other folks loved Lochrima, too, and wanted to say goodbye. That awful day came on May 1. That morning the tumor opened up and started to drain into her lungs. We had the choice to basically let Lochrima drown in her own tumor-fluids and blood, or to put her down quickly and spare her the painful dying process. And we chose euthanasia. May 1 was one of the most difficult days either of us have lived through. On the drive to Doc’s office we looked down at her crying – and she was looking up at us with tears rolling down her face. We didn’t even know that dogs cried tears, or that any moment could be so painful. That day, we also learned how much we could cry. Lochrima loved the beach. Here. at Dewey Beach DE, above right, and Jekyll Island, GA, right. She also loved a nap, and was expert at finding comfy spots like this papasan. 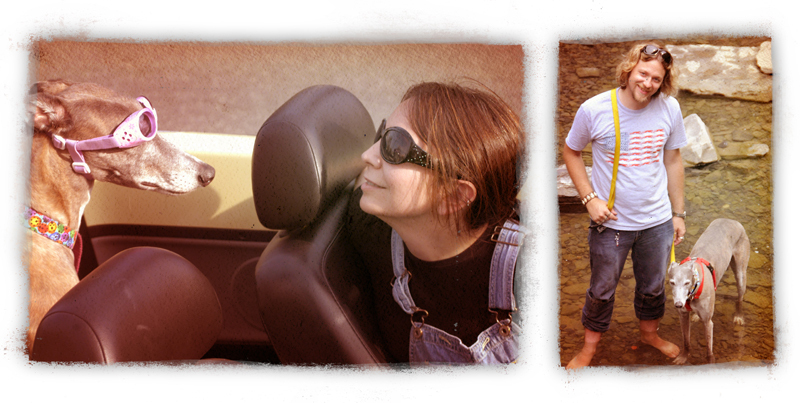 Flashback to when we drove a convertible – Lochrima loved to ride in the backseat, with Doggles of course. At right, she’s wading in the waters near Taughhannock Falls, NY. Many people say companion animals are very special friends. That’s got to be the understatement of a lifetime, really. 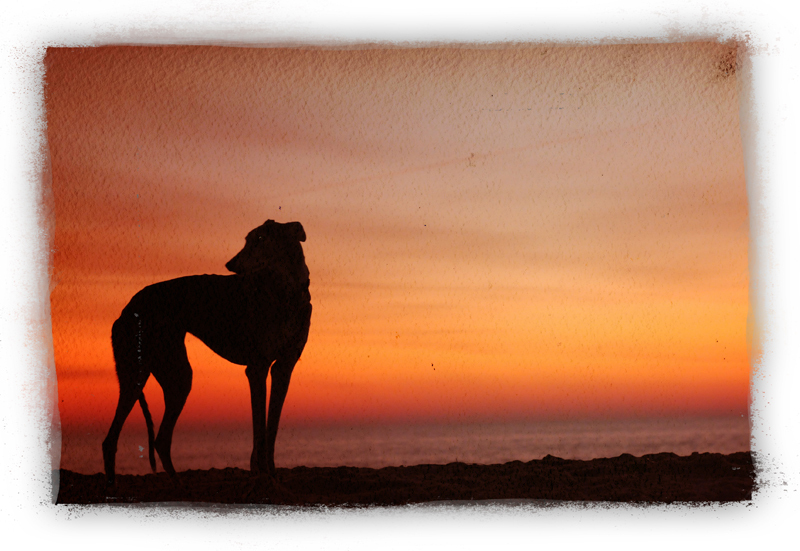 Companion animals fill the spaces that humanity cannot. They know a depth of love that brings true acceptance, forgiveness and compassion – one that people rarely offer to each other. As I type this, sitting beside the empty sofa with no hound on the fuzzy red dog blanket, the vacancy serves to remind me of how much joy, spirit and devotion Lochrima selflessly gave to us. I frequently wish I was more like her. DH & I have taken time recovering, getting back to work and daily life. We are both still broken-hearted and are no where near ready for a new dog in our lives. Yes, we know how many dogs and cats and rabbits and more need loving homes. We know our house is empty and that there is an unoccupied dog bed next to the desk. But we’re not there. Sometimes, you need space to exhale. Sometimes, she reminded us how good the simple things in life really are – like an afternoon walk or just sitting in the garden to enjoy the spring breeze. Lochrima loved being in the garden and would sit outside for hours while we pulled weeds and did other chores. 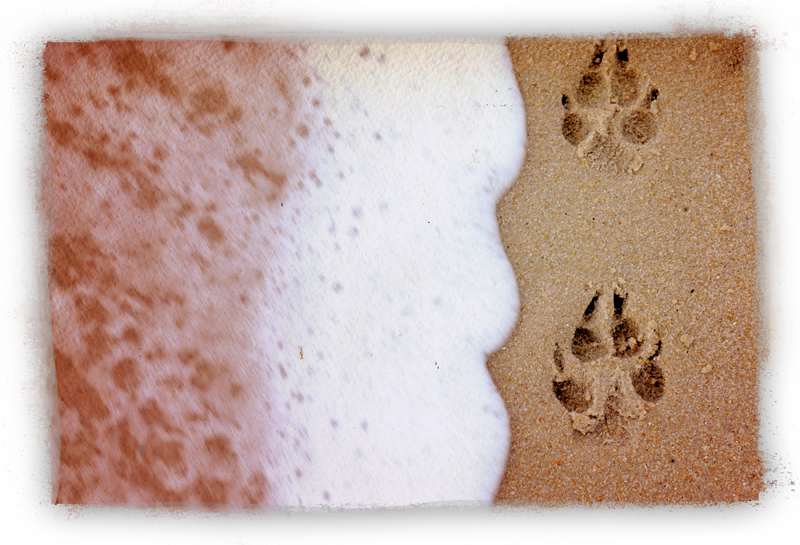 As a tribute, we plan to create a collection of the homemade dog treat recipes we have made for her. Some are already on this blog; others are still in our notebooks. If you have never baked treats for a dog (yours or a friend’s) you should get on that immediately. Nothing compares to the appreciation of a dog who has waited patiently by the oven, sniffing homemade cookies – and then eating them! Stay tuned for that later this year and if you’re local, we can use some canine taste-testers. Snow hound! 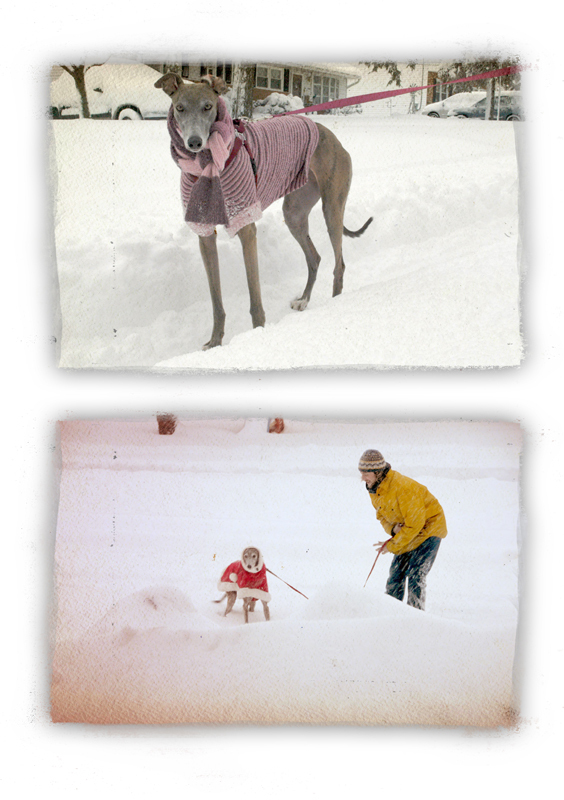 For a skinny dog with very little body fat, Lochrima LOVED the snow. She was originally from Massachusetts, after all (she raced there in her pre-rescue days). Yes, she had several coats and sweaters. The pink was her favorite. Until then, here is the birthday cake I baked for our sweet hound for many years every April 11th. She adored it with vanilla coconut-milk ice cream. Or as-is. As a final gift for Lochrima, I ask you, beg you – please celebrate every damn day you have with those you love – dogs, cats, horses, birds, people. We all get too wrapped up in nonsense sometimes to focus on what is really important – loving the way our animal friends do – unconditionally. Preheat oven to 375. Mix together flax seed meal and warm water to gel into a binder, set aside. Stir together whole wheat flour, baking powder and carob powder. Add peanut butter, applesauce, brown rice syrup or molasses and flax seed meal mixture. Stir by hand until well combined, about 60 strokes. If the batter seems too dry, add a little water (this can vary based on your peanut butter brand!). Spray a cake pan, springform pan or muffin tins with non-stick spray. Pour in batter, distributing evenly. Bake cake for about 20-30 minutes or “pupcakes” about 10-15 minutes until batter is set and a toothpick comes out clean. Cool and serve to birthday dog – or any dog you love and want to celebrate for just being your pal! A sweet sunset with Lochrima. We miss you!